Meyer unveiled its Super Blade plow, an automatically adjustable plow. It can expand from 8 feet to 10.5 feet and anywhere in between with the press of a button. The wings extend as a pair or independently. 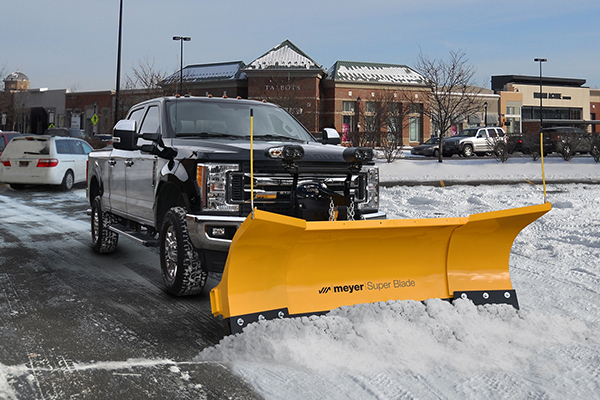 The Super Blade’s 32-inch-high moldboard allows for plowing efficiency, and at 36 inches high, the outer adjustable wings feature Meyer’s scoop and funnel design to maximize snow rolling and throwing. The Super Blade features a tubular pivot bar, with a heavy-duty center support, that runs the entire length of the critical snow impact area of the blade, and the wings are reinforced with ribs. The plow’s standard operating system has a streamlined appearance with an encased power unit and patented cable management system. The hydraulic system also features an adjustable drop speed to handle various plowing conditions and meet operator preferences. Users can attach and detach the plow in minutes with a two-plug electrical attachment, and Meyer’s free-standing jack stand allows users to adjust the plow’s height on uneven or shifting surfaces.